I suppose it is one of the more obvious lessons in life that the farther you travel from the birthplace of something truly noble and fine, the more license people will take with that fine thing, and the less recognizable it is bound to become. Certainly the most egregious example of this is the "Hawaiian style" pizza, topped with canned pineapple, and ---for some reason I've never understood--- Canadian bacon. But close behind that would have to be what Alaskans have done to fly fishing. After nearly twenty years among my fellow philistines here in the Great Land, I might be too comfortable to recognize how low we've sunk, if not for a visit one recent summer to the Catskill Museum of Fly Fishing at Livingston N. Y., near the confluence of the fabled Beaverkill and Willemowec creeks. Passing through there on vacation, my wife and I stopped to peruse the glass cases cradling aging silk leaders, oxidizing single-action reels, flies so delicate and lifelike they seemed ready to lift off from the display velvet and seek a mate above the bucolic local streams there in the Fertile Crescent of our sport. The place was as serious as The Vatican. Here lay the bones of saints, splinters from the True Cross. A group of fellow pilgrims clad in pressed chinos and tasseled loafers whispered in awed reverence. I stepped behind a display case to conceal my road Reeboks, my travel jeans; for the first time in my life I wished I had taken up pipe smoking. Before me in the case was a tiny Quill Gordon, tied by the eponymous Theodore Gordon himself, the father of American dry fly fishing. From its proud dun tail to its elegant wood duck wings it was a thing of unity, balance and symmetry, and perhaps the quintessential Eastern trout fly. Truly something to be revered. But like a kid in church daydreaming of girlie mags, my mind drifted to our own Alaskan signature pattern, The Egg Sucking Leech. Does it imitate anything as delicate and ephemeral as a May fly? Well, no. Essentially a huge purple Wooly Bugger with a ball of hot pink or red chenille tied in at the eye of the hook, it apparently mimics a bright purple leech attempting to swallow a feverishly swollen salmon egg. (In deference to readers with delicate sensibilities I will not name the variation on which the inflamed pink portion is located at the bend of the hook: ie. the terminal end of the "leech's" alimentary canal). The fact that there are no purple leeches in Alaska, and that our ordinary green and black leeches do not, as far as I can tell, actually eat salmon eggs, begs the question of whether any self respecting angler would want to be seen casting such a freakish creation under any circumstances. Yet this fly, or one of it's variations (the Egg Sucking Muddler, the Egg Sucking Zonker, the Egg Sucking Bead Head Krystal Flash etc.) is invariably mentioned on nearly every Alaskan's list of must-have patterns, and for two good reasons: it catches fish like crazy, and it embodies our disdain for all things elegant, delicate, and traditional. Alaskan fly boxes house some of the biggest, goofiest looking monstrosities outside of the World Wrestling Federation. 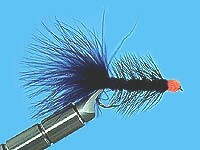 The list includes such classics as the Alaskabou ---a fist full of marabou lashed to an enormous, otherwise bare hook; the Bunny Bug ---a fist full of rabbit fur lashed to an enormous, otherwise bare hook; and, perhaps the mostly widely used of all, the Coho Fly ---a fist full of bucktail lashed to an enormous, well, you get the picture. Even when we fish dry flies we gravitate toward the grotesque. The latest rage is top water fishing for silver salmon. The fly, a large, winged wad of fluorescent pink deer hair, is called the Polliwog, though it looks more like a radioactive fruit bat. Admittedly these are all attractor patterns, and I'm sure that, decades ago, some of the fussier fly throwers of the day wondered exactly what the inventors of the Mickey Finn and the Parmachenie Belle were burning in their pipes. But in Alaska, even when we set out to imitate something specific it gets ugly quickly because there is nothing delicate about our trouts' diet. Our idea of a "natural" dry fly is the Deer Hair Mouse, or vole, or shrew (it's a blessing we haven't got woodchucks). And while it's true you may notice the odd trillion insects buzzing around your head as you fish here, our fatso rainbows don't bother sipping low calorie no-seeums off the surface when the bottom is littered with nice juicy salmon eggs. Imitating those little protein orbs has led to an angling technique that resembles fly fishing only in the tackle it uses to wet the hook. Glo Bugs, Iliamna Pinkies, and, lately, an assortment of plastic beads are arguably the most effective and least aesthetic trout baits since canned corn, marshmallows, and the Mr. Twister. But leave it to Alaskans to lower our already abysmal standards with the introduction of the "pegged" bead, the lodge guides' secret weapon for pleasing number crunching sports who have paid obscene amounts of money to be flown out to remote rivers, and really need to catch lots of fish. I'm not going to explain exactly how the pegged bead works ---in part because it is illegal on many of our rivers, but mostly because it is so deadly you would have try it any way. Let me just say that a problem with plastic beads is that while they look exactly like salmon eggs, unlike roe they are rock hard, so a trout will mouth nearly every one you drift near him, yet spit them out faster than you can calculate your guide's tip. But a "pegged" bead is virtually impossible for a trout to spit without getting the hook in his face, no matter how quick he is. And, presto, it's "Fish on!" all day long. Is it effective? Beyond your wildest dreams. Is it fly fishing? In Alaska it is. Though these tactics may sound like incredibly bad form, in all fairness to pegged bead devotees, a trout foul-hooked on the outside of the mandible is probably less prone to injury than one that has inhaled a realistic baitfish pattern. Still, the use of some of these Alaskan patterns, and particularly beads, while elevating catch rates, has culled much of the skill, the finesse, and, some might argue, the fun, from both fly tying and fly fishing. I have no desire to go back to the Fan Wing Coachman dressed with home made paraffin and gasoline floatant, any more than I want to trade my toasty neoprenes in for rubber hip boots, or my graphite rods for that Sears fiberglass club I started out with forty years ago. But you can whip up a half dozen Coho flies or Alaskabous in the time it takes to tie one decent Prince Nymph, and there is actually a little tool that extrudes perfectly spherical Glo Bugs. And, let's face it, it's almost impossible to fish a Bunny Bug incorrectly. Then there are the pegged beads, which will hook fish while even the most reflex-challenged angler is busy gazing up at the clouds pondering life's great mysteries, such as the presence of Canadian bacon on a Hawaiian style pizza, for instance. The fact is, here in Alaska, I've actually seen a bait fisherman (apparently overcome with either nostalgia, or Coleman fumes) carrying his cured salmon roe on his hip in a beautiful old wicker creel. So you have to go way out of your way to offend anyone's sense of tradition ---or even find one. I mean, around here, when the spawned out salmon carcasses begin to rot, you're considered a bit of a snob if you fish maggot patterns while everyone else is using "flesh flies." And we don't limit our blasphemies to pattern selection. We do things to presentation that would put Gary Borger in therapy. Any day during the sockeye run, you will find several hundred if not several thousand anglers at the Kenai/Russian River confluence, a designated "Fly Fishing Only" area, standing, quite literally elbow to elbow, plunking #2 Coho flies weighted with rubber-core sinkers the size of your baby finger. As long as the fly itself is unweighted and the sinker is attached at least eighteen inches above the hook, The Alaska Department of Fish and Game decrees that this is indeed fly fishing ---not that anybody would mistake it for fly casting. With that much lead on, you're not going to attempt a back cast, of course, because you would either snap the tip of your rod or kill someone in the crowd standing behind you waiting for your slot in the meat line. In fact, smart anglers eschew bulky fly line in favor of straight mono. The fly is delivered in a short flip a few yards upstream from your position; then as it sinks, you follow it with the tip of the rod until it begins to rise at the end of the drift, give a hopeful and hefty yank (in case a salmon has foolishly ventured near the point of the hook) and flip it back upstream again. You do that over and over and over, all day and all night, if necessary, until you've beached your three salmon limit. This only works if the guys snugged up against your elbows coordinate their sinker flips with yours. And when things are going well, and there aren't too many rookies in the mix, an entire stretch of the riverbank will become a kind of undulating ballet of rods rhythmically rising and falling in unison, their steel line guides glinting in the afternoon sun. As fly fishing goes it's as close to beauty as we get up here. I swear it can bring a tear to your eye. Realistically, it's the only effective way to catch sockeye in that particular piece of water, and their oily red flesh, pan fried in butter with garlic and a little dill, justifies almost anything. Even so, Alaskans' perverse corruption of the sport can not be explained entirely in terms of food-gathering pragmatism. A guy I know from Anchorage, an educated and otherwise civilized person who actually grew up on the classic small streams of Pennsylvania, fishes our catch and release steelhead rivers using a gorgeous split bamboo rod. I could describe the soft caramel coloring of the cane, the fine silk wraps. But the salient detail is the way he rigs it with a long leader of 10lb test Maxima, two or three split shots the size of gum balls, and a hank of pink Glo Bug yarn cinched into the knot at the eye of an otherwise bare hook. "Barbaric," you snort? Maybe. But in some other, far better life, you might catch half as many steelhead as that guy does. To the purist all this must sound like some newly discovered circle of hell: a place swarming with huge trout and salmon and no respectable way for a person of refinement to catch them. Here's what I recommend: Slip into that tweed walking jacket and fire up your meerschaum; clamp a fine wire dry fly hook in your vise. Carefully tie in several stiff fibers from a high quality medium dun hackle feather for the tail, then a stripped peacock quill for the body; add two perfectly matched barred wood duck wings, and another medium dun for the hackle itself. It's beautiful, isn't it? OK. Now, tie in two wraps of the hottest, flaming pink chenille you can buy, (don't worry if you smash the hackle or the wings), knot the fly to your tippet, clamp at least two large split shot a foot above it, and fish the damned thing right on the bottom. You may be in Alaska, but that whirring sound you hear is coming all the way from the grave of Theodore Gordon.